Seth C. Cary, John Cary, the Plymouth pilgrim, , at https://books.google.com/books?id=oDgcAAAAYAAJ . Boston, Massachusetts: (1911) , p. 175. Vermont. Secretary of State, General index to vital records of Vermont, early to 1870, Salt Lake City: Filmed by the Genealogical Society of Utah, (1951) , Batch number: 7450048, Source Call No. 0027502. Vermont. Secretary of State, General index to vital records of Vermont, early to 1870, Salt Lake City: Filmed by the Genealogical Society of Utah, (1951) , Batch number: 7450046, Source Call No. 0027500. Vital records of Bridgewater, Massachusetts, to the year 1850, Boston, Massachusetts: New England Historic Genealogical Society, (1916) , p. 70. "Illinois Deaths and Stillbirths, 1916-1947," database, FamilySearch (https://familysearch.org/ark:/61903/1:1:NQ43-GS7 : 27 December 2014), Seth W. Cary, 03 Jun 1920; Public Board of Health, Archives, Springfield; FHL microfilm 1,562,486. Sewell Cary was born on September 14, 1835 in Waltham, Massachusetts. He was the son of Ebenezer Cary and Suzan Ann Wyman. Vital Records of Brockton Massachusetts to the year 1850, , at https://archive.org/details/vitalrecordsofbr00broc . Boston, Mass. : New England Genealogical Historic Society at the charge of the Eddy Town-Record Fund, (1911) , p. 318. Unknown author, Gardiner, Maine Vital Records (n.p. : n.pub., unknown publish date), Vol. 2, p. 238. Seth C. Cary, John Cary, the Plymouth Pilgrim (n.p. : Seth C. Cary, Dorchester Center, Boston, MA, 1911, unknown publish date), p. 178, sec. 142-A. Unknown author, Gardiner, Maine Vital Records, Vol. 2, p. 544. year by subtraction. Unknown author, Gardiner, Maine Vital Records, Vol. 2, p. 544. "Massachusetts Deaths, 1841-1915," database with images, FamilySearch (https://familysearch.org/ark:/61903/1:1:N476-S97 : 10 December 2014), Sophia Cornelia Dyer, 28 Jan 1912; citing Spencer,,Massachusetts, 347, State Archives, Boston; FHL microfilm 2,399,154. Seth C. Cary, John Cary, the Plymouth pilgrim, Boston, Massachusetts: (1911) , Section 69-A, p. 123. 1880 United States. Census Office. 10th census, 1880 federal population census, Washington, District of Columbia: National Archives and Records Service, ([19--]) , FHL Film 1254566; National Archives Film T9-0566; Page 268D. Vital records of Colrain, Massachusetts to the end of the year 1849, Salem, Mass. : Essex Institute, (1934) , p. 64. Vital records of Brookfield, Massachusetts : to the end of the year 1849, , at https://archive.org/details/vitalrecordsofbr00broo . Worcester, Massachusetts: Franklin P. Rice, (1909) , p. 58. "Maine, Births and Christenings, 1739-1900," index, FamilySearch (https://familysearch.org/pal:/MM9.1.1/F43J-3VP : accessed 16 Dec 2012), Thomas Hill Cary, 15 May 1828; citing reference , FHL microfilm 10606. Seth C. Cary, John Cary, the Plymouth pilgrim, , at https://books.google.com/books?id=oDgcAAAAYAAJ . Boston, Massachusetts: (1911) , p. 247. Church of Jesus Christ of Latter-day Saints. Salt Lake Temple, IGI reference to Endowments for the dead, 1893-1970; heir indexes, 1924-1956; baptisms for the dead, 1941-1970, Salt Lake City: Filmed by the Genealogical Society of Utah, (1959-1979) , Film Number: 446258, Page Number: 0053, Reference Number: 70989. Church of Jesus Christ of Latter-day Saints. Salt Lake Temple, IGI reference to Sealings for the dead, couples and children (includes some living spouses and children) 1943-1970; heir indexes, 1943-1965, Salt Lake City: Filmed by the Genealogical Society of Utah, (1959, 1975, 1980) , Film Number: 457745. 1880 United States. Census Office. 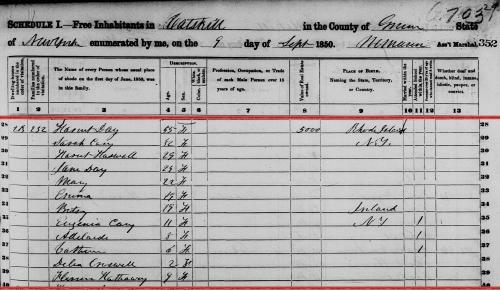 10th census, 1880 federal population census, Washington, District of Columbia: National Archives and Records Service, ([19--]) , FHL Film 1254533; National Archives Film T9-0533; Page 60D. Seth C. Cary, John Cary, the Plymouth pilgrim, , at https://books.google.com/books?id=oDgcAAAAYAAJ . Boston, Massachusetts: (1911) , p. 246, sec. 266. Church of Jesus Christ of Latter-day Saints. Salt Lake Temple, IGI reference to Sealings for the dead, couples and children (includes some living spouses and children) 1943-1970; heir indexes, 1943-1965, Salt Lake City: Filmed by the Genealogical Society of Utah, (1959, 1975, 1980) , Film Number: 457774. Church of Jesus Christ of Latter-day Saints. Logan Temple, IGI reference to Sealings of children to parents, 1884-1943; heir indexes, 1884-1943, Salt Lake City: Filmed by the Genealogical Society of Utah, (1958) , Film Number: 178108, Page Number: 402, Reference Number: 14085. Vital records of Colrain, Massachusetts to the end of the year 1849, Salem, Mass. : Essex Institute, (1934) , p. 15. Seth C. Cary, John Cary, the Plymouth pilgrim, , at https://books.google.com/books?id=oDgcAAAAYAAJ . Boston, Massachusetts: (1911) , p. 246. Seth C. Cary, John Cary, the Plymouth pilgrim, Boston, Massachusetts: (1911) , p. 246. Vital records of Colrain, Massachusetts to the end of the year 1849, Salem, Mass. 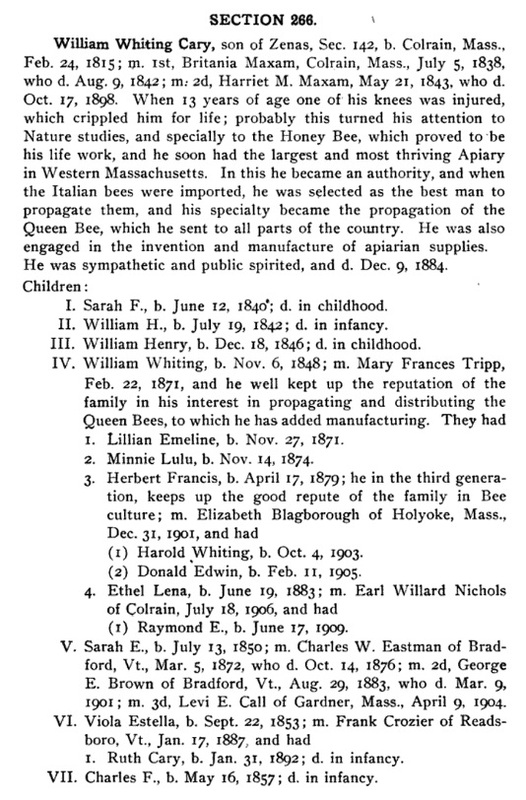 : Essex Institute, (1934) , p. 15, citing Colrain Vital Statistics recorded in "Biographical Review." Massachusetts Vital Records, 1841-1910, , Vol: 42 ; Page: 226. 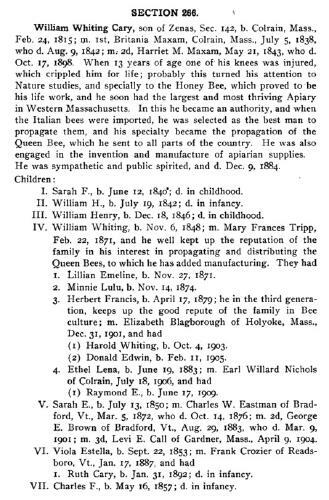 Seth C. Cary, John Cary, the Plymouth pilgrim, Boston, Massachusetts: (1911) , p. 246, sec. 266. Seth C. Cary, John Cary, the Plymouth pilgrim, Boston, Massachusetts: (1911) , p. 247. Massachusetts Vital Records, 1841-1910, , Vol: 304 ; Page: 305. Massachusetts Vital Records, 1841-1910, , Vol: 259 ; Page: 345. Zebulon Cary was born perhaps about 1778.